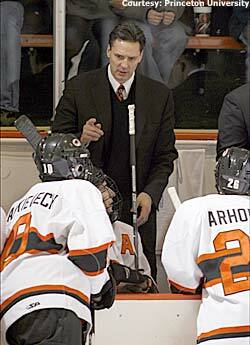 Princeton Tigers head coach Guy Gadowsky wanted to come to coach at the top-ranked academic institution to help build it into a top hockey program. Donned in 20 black jerseys with no names on the back, the Princeton Tigers are one minute away from taking the ice for their last regular-season game, at St. Lawrence University, last Saturday night. "It's a good night to be wearing black, boys," says one firm voice in the road-team locker room at SLU's Appleton Arena -- the geographic outer limits of the ECACHL. There have been a lot of good nights for Princeton during the 2007-08 season -- especially since Dec. 30, when the Tigers went on a 12-2 roll entering last weekend to end the best regular season in the program's 108-year history with a 17-12-0 (14-8-0 ECACHL) mark. All good for a best-ever second-place finish in the league. "Our team motto is: 'Enjoy what we do,'" says senior captain Mike Moore said after the game, a 3-2 loss by the Tigers. "That means whatever we do, like drills at 7 in the morning and then go to class, or whatever." Consistent finishes in the outer limits of the conference standings appear over for the program that boasts two famous puck alums in Hobey Baker and George Parros. Baker, a legend on the ice, gave the ultimate sacrifice as a World War I fighter pilot killed in the line of duty. The NCAA's best player award is named after him. Parros took his turn hoisting the Stanley Cup last spring with the Anaheim Ducks. Prior to this season, the Tigers never had finished higher than fourth in the conference, and only four times finished in the top-half of the league. Princeton also won its first Ivy League title since 1954. They also came within two goals last weekend of winning the ECACHL title outright. Friday night at Clarkson, with first place on the line, the Tigers took a 3-2 lead into the third period, but bad puck luck and bad penalties gave Clarkson its second consecutive conference title with the 4-3 win. "They are very fast," Clarkson coach George Roll said of Princeton, "and when they are on the puck, they are very aggressive." Saturday night at St. Lawrence, the Tigers started fast and were very aggressive, jumping out to a 2-0 lead before the Saints marched back with three unanswered goals. The incremental rise of a program with a yearly roster of future doctors, lawyers and corporate chiefs -- along with 13 recent pro hockey graduates -- won't be derailed by two one-goal losses. "They're in there already talking about these two games," fourth-year Tigers coach Guy Gadowsky said after the loss to SLU, "about coming back strong in two weeks." While Princeton has had many good nights this season on the ice, the program had one great night, when the sartorially splendid and erudite-sounding Gadowsky made the decision to leave the Alaska-Fairbanks bench -- and the powerful CCHA -- for central New Jersey. "Because it's Princeton," said Gadowsky. "It's been ranked the No. 1 academic institution for eight years in a row. It's an absolute honor to work at Princeton and to work with the types of athletes we have in that locker room." What's the key to building a No. 1 hockey program? "We came in with really only one goal; and that was to have the guys love to be a part of Princeton hockey,” the coach said. “And we didn't know how long that would take. I know we have achieved that goal. The guys are having an absolute blast here." Gadowsky also didn't know the bruising building block he had in place when Moore, a defenseman, came in the front door as a freshman to help begin the rebuilding process. "Mike Moore is, No.1, absolutely our key guy. He's an extreme physical presence," Gadowsky said. "He's a scary guy to play against. As a matter of fact, he deserves more credit for the development of our defensemen than any of us coaches." "I can't take credit for our success," said Moore. "Everyone is leading it." How does Gadowsky describe the other building blocks? "Then comes Lee Jubinville,” the coach said. “If you could pick one player that typifies how we play, he's the guy. He's our No. 1 scorer (11-26-37), but he's a better defensive player than offensive. Yet, these Tigers clearly like the offensive side of the game. "Somebody said that in the ECAC there are 11 teams trying to be the New Jersey Devils and one trying to be the '84 Oilers,” Gadowsky said. “I think that's pretty cool. "We like to score goals and I like that. … We give up our fair share but we have a goaltender that's extremely calm and his demeanor is the perfect demeanor for our team." The high-octane Tigers in the Princeton tank also include seniors Erik Pridham, Keith Shattenkirk, and Landis Stankievech, a Rhodes Scholar. Juniors Brandan Kushniruk and Brett Wilson, sophomores Kevin Kaiser, Cam MacIntyre, Mark Magnowski and Dan Bartlett, and freshmen Kevin Lohry and Mike Kramer also fuel the offense. Defenseman Mike Moore is considered the Tigers top player with 28 points this season. "Gad's brought in some great players," said Jubinville. "And each year we've gotten better." "Our surprises," said Gadowsky, "have been Kevin Lohry, who plays the game at extreme speed, and Brad Schroeder. He's been our most consistent defensive defenseman. He's a horse." Adding to that defensive effort is a stable of blueliners that all stand at least 6-feet tall: Moore, Schroeder, senior Kyle Hagel, and underclassmen Jody Pederson, Taylor Fedun and Matt Godlewski. "And then comes Zane Kalemba," Gadowsky said, adding a smile while discussing his sophomore goalie. "The way Zane plays has also been very important to our young defense." "My personal opinion," said Kalemba, "is we're the best team in the league. We've proven that some nights and now we need that to be consistent." Princeton's consistency into last weekend started Dec. 30. "The turnaround reasons are twofold," said Gadowsky. "One, our ‘D’ corps is very young. The second is we were only getting scoring from one line early in the year. The game before Nebraska-Omaha (Dec. 30), they scored, but played at a minus. So I said, 'Hey, if they're going to score and play at a minus, they'll sit this game, and we'll see who’s going to score.' Other players then took the onus to score." The Tigers’ postseason history isn’t a long one -- an NCAA at-large appearance and an ECAC tournament title-game loss in 1998. To get the NCAA tournament this season, the Tigers likely will need to win the ECAC tournament in two weeks. There are 10 at-large bids available, but at No. 17 in the national rankings, an at-large bid is not a certainty for Princeton. "Success will be defined a decade down the road,” said Gadowsky. “They love to play hockey; the bonus is playing with an incredibly quality group of guys, and being honored to play at a school like Princeton." On Campus Clips -- The surging North Dakota Fighting Sioux have the nation's longest unbeaten streak, at 14-0-1. ... Michigan clinched its 10th CCHA regular-season title in the past 17 years Friday night. ... Army swept second-place Sacred Heart for its first-ever Atlantic crown. ... Bemidji State took the CHA title. ... Either Colorado College or North Dakota are poised to claim the WCHA championship this weekend, the last of WCHA play, with CC holding a two-point lead. ... Senior goaltender Peter Mannino set the University of Denver all-time shutouts mark at 14 with 21 saves in the No. 7 Pioneers' 1-0 win against Michigan Tech last Friday. 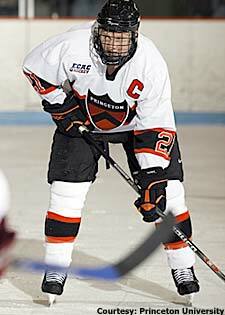 Mannino was MVP of the 2005 Frozen Four as a freshman. ... Jeff Lerg is among 11 finalists for the James E. Sullivan Memorial Award that honors the outstanding amateur athlete in the United States. Lerg backboned the Michigan State Spartans in goal en route to last season's national championship win against Boston College, 3-1. The award will be announced April 1.